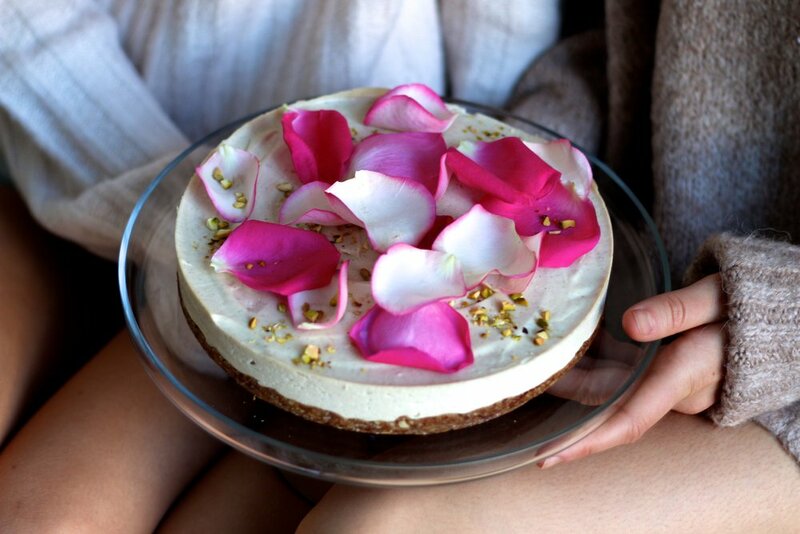 Inspiration: Things I love; the sea, post yoga endorphins, and this cheesecake. I have a feeling you will too. Rinse almonds. In blender or food processor, pulse until mealy. Transfer to mixing bowl. Add dates to blender or food processor and pulse. Add to mixing bowl with vanilla and sea salt. Line bottom of spring form pan with parchment paper that has been cut into a circle. Press crust into pan evenly, but not perfectly. Place in freezer. Rinse cashews. Blend with remaining ingredients, except vanilla bean, until smooth and creamy. To remove seeds from vanilla bean, cut a vertical line down the centre, splitting it in half. Take a deep breath, because it smells unreal. Scrape seeds using small spoon, add to mixture and blend another 10 seconds. Remove crust from freezer and pour filling over top. Freeze around 4 hours, or until solid. Rose petals are a gorgeous touch. I also topped this cheesecake with crushed pistachios. Thaw for 15 minutes before serving up slices of pure love.